Abstract: The Orange orb is Thermaltake's brand new replacement for the almost one year old Blue Orb (or 'Blorb') chipset cooler. 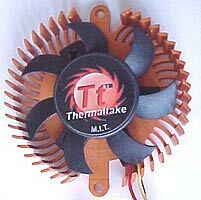 The Orange orb is Thermaltake's brand new replacement for the almost one year old Blue Orb (or 'Blorb') chipset cooler. The Blue orb was the first 'boutique' chipset cooler to really make an impact; its release in the fall of 2000 coinciding neatly with Geforce 2 cards becoming affordable to the average gamer. The Blorb offered a cost effective way to squeeze a little extra performance out of your video card, if you were so inclined, or to at least have some assurance that your precious GTS core (or VIA northbridge) was not about to fry itself due to inadequate stock cooling. It also looked pretty. First impressions of the new Orange orb ('Oorb') are somewhat uninspiring. As compared to the Blue orb, both the heatsink and the fan are noticeably smaller in terms of depth, and in fact the whole thing looks very similar in dimensions to any of the stock HSF combos to be found on say Asus, Leadtek or MSI Geforce 3 cards. On the bright side, this means that the Oorb will not eat up your first PCI slot like the Blorb would. When you flip it over, the major difference between the Oorb and it's older sibling becomes apparent. 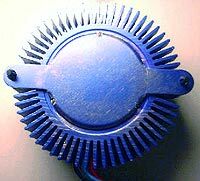 The base and fins of the Orange orb are shaped from a single, seamless extruded piece of aluminum, the only breaks being three holes for the fan screws and two more for the clips to attach the heatsink. This construction method gives the Oorb a couple of advantages over the Blorb, where the fins and the base are separate units bonded together. First of all, having no bonding material separating the base from the fins makes it easier for heat to transfer to them. 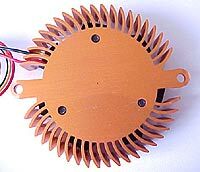 Secondly, the effective base area of the heatsink is increased significantly, from about 30mm to about 38mm. This means that the orange orb, unlike the Blorb, is actually able to cover a Geforce 2 core completely. Despite the Thermaltake website's claim that the fans on both orbs run at the same speed, the Oorb fan ran right around 5000RPM, while the Blorb was at 5500RPM. The fan on the Oorb really does not feel like it is pushing much air. Notice the Orange orb is a 1 piece heatsink while the Blue orb is 2 pieces bonded together. Installing the orange orb exposed a couple of problems with its construction, one just slightly annoying, and the other potentially fatal to your precious hardware. Instead of the straight up and down spring clips that Thermaltake employed on the Blue Orb, the clips on the orange orb use a bent piece of metal to provide the tension. These two pieces of metal are the cause of both problems. First of all, they stick out about 3mm from the body of the heatsink, which means that the orange orb actually takes a fair bit more space to mount properly than the Blorb. Now this would not be such a big thing, especially since the clips can be rotated so that the metal pieces are almost flush with the body, except for one little detail... It is quite possible to rotate the two metal pieces into the arc of the fan! Now, on the average full size Geforce2 card, I could see this not really being a problem as there is plenty of room to mount the fan without having to twist the clips around. However, on my MX, which is what I would call a 'half height' card, I had to twist the clips almost flush with the body before the orb would seat itself properly between the various components. The two 'springs' are now perilously close to interfering with the fan blades... this is just bad design. Besides this little issue, I had no other problem seating the orb firmly onto the core, which it covered completely.